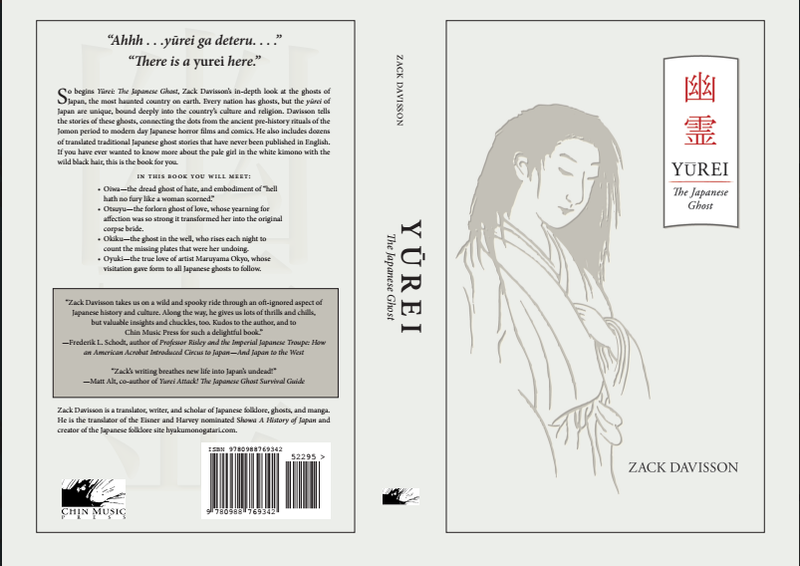 First off, my deepest gratitude to everyone who preordered my book Yūrei: The Japanese Ghost. It really means everything to me to have your support. And equally my sincerest apologies on the continual delays. The most disappointing part of this whole process is knowing I have let you down, and lost some of your confidence. I know from personal experience how frustrating it can be to see books fall from publication date and continually be delayed. I met with my publisher recently and we created a schedule to get the book back on track, aiming for an early 2015 publication date in either January or February. I feel confident that this is a target we can hit. Without going into too many background details, the cause for the delays was due to several factors. We were operating under a tight schedule to try and hit an October publication date and hopefully pick up some Halloween boost from booksellers. In order to hit that deadline, everything would have needed to be absolutely perfect with no margin of error. Unfortunately, that means we skipped some steps in our rush that only caused further delays down the road instead of speeding up the process. On top of that, the book designer we hired delivered a book that was totally out of synch with the style of my writing and what I was trying to accomplish. It was more “Pop culture” and less “Classic” than I was aiming for. With that, we had a hard decision to make which was to trash the current design and got back to the drawing board; look for a book designer that could do something more in line with my sensibilities—a move that would cost both time and money—or just publish the book as-is in order to meet our deadlines and have a book on the market. Ultimately, I decided it was more important to me to think long term instead of short term, and to delay the book by several months in order to have a book I could be proud of for years to come. My publisher has supported me on this, for which I am very grateful even though we are losing money for every month the book is delayed. Ultimately, we decided the integrity of the book is more important than the money, which is probably not a decision that a larger publisher would have made. The new book designer is brilliant and exactly in line with what I want to achieve. I feel very confident about the direction the book is heading. Things are moving along, and you can expect to see a really wonderful book at the start of the new year. Again, thank you for your continued support, and my sincerest apologies for the delays. In the modern publishing world, with a first-time author working with a small press publisher, every single reader is extremely important and appreciated. Yūrei: The Japanese Ghost just needed a little more time in the oven than we imagined, and I am sure you will all appreciate the final efforts even more. This is Nikolai, from NihongoShark.com. If you want, we can make a post on my site for your book to help boost sales (hopefully). We can make it a guest post, or I can just send you some interview questions. I have around 2,000 subscribers that are studying Japanese, so I’m guessing at least a few of them would be interested. Anyways, feel free to send me an email if you’d like to set something up. Well, once I had to wait more than a YEAR for a book I had pre-ordered. But I was happy when it finally came. I have been looking at Mizuki’s “NonNonBa” and “Kitaro” at Amazon.ca for many days now. After reading your post, I decided the time had come to pre-order your book and to add on the two Mizuki books mentioned above. My dad loved Dickens’ “A Christmas Carol” so this time of year is fairly ghostly for me. Thanks for that awesome kappa kingdom today on FB! Zack, anything worth doing is worth doing well. One of the things I love about your blogs is the professionalism they exude. Enough detail to satisfy the scholar, yet extremely readable. Koizumi Yakumo would be proud. fear not, Ghostmaster – a good book is always worth waiting for!! I have some experience in the publishing field and the delay is understandable to me. My faith in pre-ordering is confirmed by your decision to go for design which supports your style. I am glad your publisher supported you. Your works are worth the wait. Good things come to those who wait. Amazon Germany has fixed a new publishing date: April 14. That’s almost a year after I pre ordered it. I’m looking forward to your book very much, but will there be any more delays?